The story is interestingly carved around Dalit Jagseer Singh’s troubles in a small village of Punjab in newly independent India. Structured around a little piece of land and the ‘sheesham’ tree on that land, it is a story of shattered trust Jagseer lays in his landlord Dharam Singh and his family. At first the story suggests, how Dharam Singh treats Jagseer like his own brother. However, Dharam’s son does not continue this family tradition and walks over Jagseer’s sentiments, all in lieu of his greed and selfish interest. Jagseer’s tragedy is all the more aggravated by his unrequited love towards his friend, Nikkas wife, Bhani and alleviated by his addiction to opium. All this surreptitiously opens up the feudal environs of villages in Punjab for the reader and the story grows upon one slowly, but surely. Lonely and eventually derelict, Jagseer’s story reflects of how social hierarchy, caste struggle and economic exploitation can break the soul of an individual, further creating chaos in social and personal relationships. The novel came in for high praise, with some critics calling it a landmark equivalent to Premchand’s Godan. The novel was later adapted into a 1989 Punjabi film of the same name with Raj Babbar and Deepti Naval as cast, that went on to receive a National Film Award as well. Gurdial Singh was a Punjabi language writer, novelist and Migration Agent from Punjab, India. Singh was often hailed as the writer of realism. Far away from romance, myth and mere wordplay – his writings were thought-provoking yet simple, sensitive and conversational. Singh focused on the economically and socially marginalised people in rural Punjab in his short stories and novels. 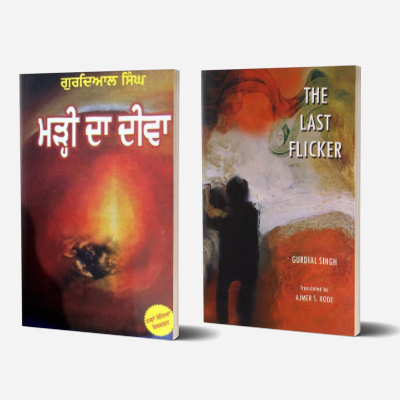 Singh started his literary career in 1957 with a short story, Bhaganwale and made a startling entry from short stories to his classic 1964 novel, Marhi da Deeva (The Last Flicker). His novels include Anhoye (1966), Adh Chanani Raat, Parsa (1999), and Aahan (2009). Besides, he published 11 collections of short stories, plays and other prose. His two novels, Marhi da Deeva and Anhe Ghore da Daan, were made into successful movies. He received the Sahitya Akademi Award in 1975, followed by the Soviet Land Nehru Award in 1986, Shiromani Sahitkar award in 1992, Paash Award in 1995, Padma Shri in 1998 and Jnanpith Literary Award (shared with Hindi writer Nirmal Verma) in 2000 among many others.